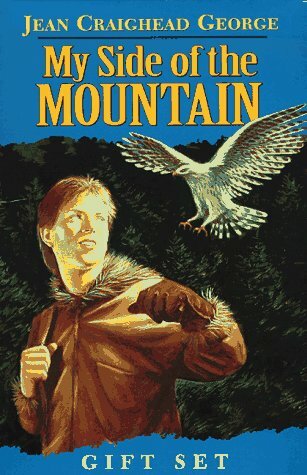 Summer is a great time for reading, daydreaming and nostalgia. . .perfect for my Children’s Title choice for Back-to-the Classics Challenge: My Side of the Mountain by Jean Craighead George. I’ve never read this book before, but I know the basic story. When I was a kid, somewhere in that elementary school range, the movie theater near us used to have summer matinees for kids. You could buy a block of tickets at a discount and see movies during the weekdays–but they were specific movies, old kids’ movies. My memory is a bit hazy, but I think my siblings and I got these blocks of tickets three summers in a row and most of the movies were the same year after year. I recall seeing Fantasia and not really getting the point of it. Yellow Submarine was more of a treat. My absolute favorite was The Trouble with Angels. And we saw My Side of the Mountain–a perfect summer movie for kids. My kids have never seen the movie, but when they were younger they read the book and the sequels and loved them. When it came time to pick a classic children’s book, I thought–that’s the one! The book is plotted slightly differently than I remember the movie. Sam Gribley runs away from his home in New York City not because he is disgruntled that a family summer vacation has been cancelled, but simply because he wants to go live in the woods. When he tells his father what he plans to do, his father just laughs and says go ahead. Sam takes a bus to the Catskills and hikes into the mountains where he locates the ruined homestead of his Gribley ancestors. There he carves out a shelter in the trunk of a massive old tree and begins to live off the land. He makes a couple trips into a nearby town to visit the library and gather information on things necessary for what he is doing, but for the most part, he hides from people and keeps his doings as secret as possible. He records his trials and successes on bark. Occasional excerpts of his writings are provided, but mostly the reader follows along with Sam’s thoughts and actions as he lives his daily life. It is beautiful in its simplicity. He forages and hunts. He trains a falcon to hunt for him. He makes friends with a badger and a raccoon and once, a lost hiker. This is a story that can still fire the imagination of a child. What if and if only. . .
As a jaded adult, I have to look on it with a sad smile of indulgence because the book reads more as a fantasy than as anything a child could actually pull off–and yet as a kids’ book– what a wonderful dream. The adults in the story are fairy tale adults. It’s a wonderful adventure with a protagonist who succeeds with fairly minimal effort (although it sounds like convincing enough effort for a kid), has conflicts that are not especially frightening, and is left with a happy ending with hint of poignancy. It’s a book that should be read to children or by children to be best appreciated. These are the best kind of summer daydreams. 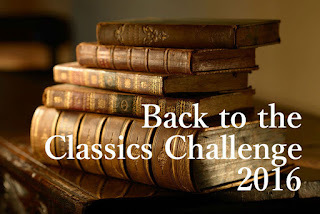 The Back to the Classics Challenge is hosted by Sarah Reads Too Much. I'm off work this week, having a staycation, so I'm taking part in the new Book Blogger Hop, hosted by Ramblings of a Coffee Addicted Writer. My answer to this is: Organize? There are parts of my life that need to be organized. Reading, thank God, isn't one of them. I have overflowing bookshelves and piles of books on many flat surfaces in my house and two electronic devices that are starting to collect books that I intend to read. My system is to read what appeals to me next when I finish whatever I'm currently reading. Exceptions are books that I have to read for one of my two book groups and books that I have agreed to review for the Historical Novels Review--these have deadlines. I try not to leave books with deadlines till the last minute because I don't like feeling like I have to read a book. I do feel overwhelmed at times by all the books I want to read. There are times I am resentful of my TBR pile because I don't feel justified in acquiring a new book when all those old books are staring accusingly at me. But I don't think I need a better system. It's more time that I need. How about you, other hoppers? Have you got systems that work well for you? There are books on my TBR pile that I have turned into projects, projects so daunting that the books themselves become impossible to read. Ridiculously, one of these books was Passion by Jude Morgan. It sounded wonderful. Passion follows the lives of the women involved with the Romantic poets Byron, Shelley and Keats. The poets, of course, are prominently featured as well. The book got rave reviews. I had to read it. I bought the book--years ago. The love lives of the Romantic poets told from the women’s point of view seemed like such a tremendous idea for a novel, but after I bought the book and reflected, I didn’t think I was ready for it. I know nothing about these poets or Romanticism. Poetry isn’t really my thing. Would I be able to fully appreciate the novel? Before reading it, shouldn’t I take some sort of crash course? Read some poetry? History? Some literary criticism? Something? Of course, I didn’t. Instead, the book sat on my shelf waiting for me to have time to do it justice. Because I kept hearing such great things about Jude Morgan’s writing, I bought The Taste of Sorrow about the Bronte sisters, but haven’t read that yet either, and finally, exasperated with myself, I borrowed A Little Folly from the library to give myself a deadline. (It was delightful. Review here.) 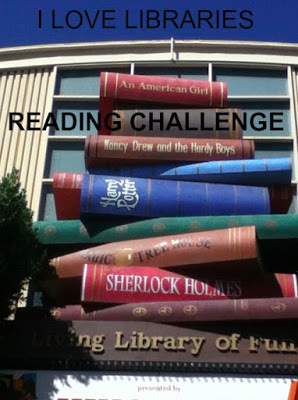 In the meantime, I put Passion on my TBR pile challenge list. No more stalling. After all, I read historical fiction as introduction to history–to learn something or pretend I’m learning something when what I’m really doing is reading for pleasure. And what an absorbing pleasure this book is. 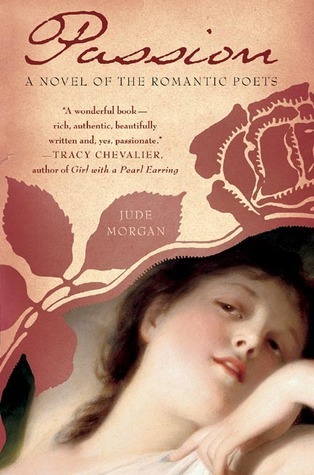 Jude Morgan could have written a captivating historical novel about any one of the love stories–there is abundant material here. The setting, England during the French Revolution and Napoleonic Wars, is a fascinating backdrop, although the history intrudes very little on the private lives of these particular citizens, concerned as they are in theory with the state of the world. But by choosing to intertwine all their stories: Mary Shelley, Claire Clairmont, Caroline Lamb, Augusta Leigh, Fannie Brawne and Annabelle Byron (even Mary Wollstonecraft makes a cameo appearance), the book becomes more than biographical fiction. It really is a story about passion. The various complicated personal histories are larger than life, but the author’s skill in getting inside their heads, using a variety of styles and narrative voices, makes them all very real. All the accolades that Morgan receives for his writing are well deserved. It’s quite amazing that he can make so many literary geniuses sound distinct and convincing. 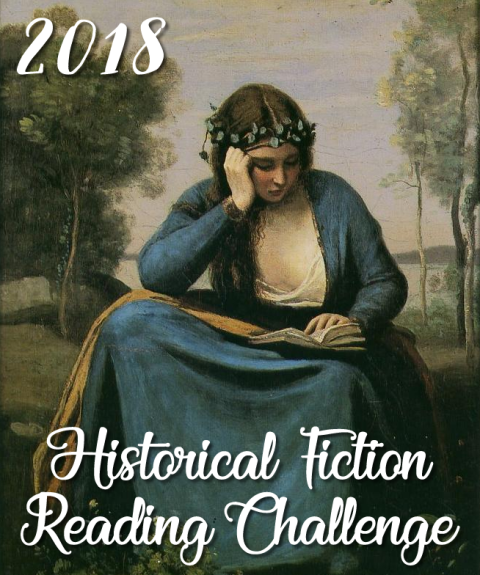 I’ve completed 7/12 books for my TBR pile challenge hosted by Roof Beam Reader and 22/25 for the Historical Fiction Challenge hosted by Historical Tapestry. Many, many years ago, good fortune led me to a copy of Silver Pigs by Lindsey Davis. I have steadfastly followed Marcus Didius Falco’s career through all twenty books in the Falco series (adventure/crime novels set in ancient Rome). They were all enjoyable, though of course some were better than others. Falco is a strong personality and the variety of the mystery plots mixed with the interpersonal problems of Falco, et. al. remained entertaining. That said, it was clear that the series was reaching the end of its natural life. Falco was aging. His children were growing up. His relationship with his wife had been explored to the point that Helena risked becoming dull. So, what next? 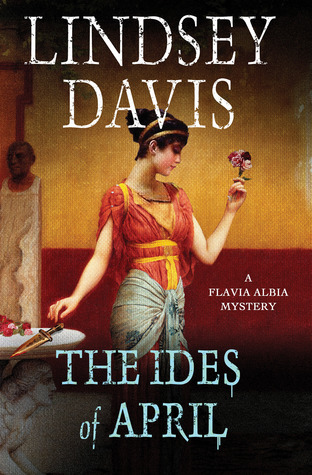 Lindsey Davis gives us The Ides of April. The book jacket calls it– Falco: The Next Generation. Fans will remember Flavia Albia, the British orphan Falco and Helena adopted. A little wild, sharp-eyed and sharper-tongued, Flavia Albia is now a widow nearing thirty, twelve years after Falco has retired from informing/investigating to take over his father’s antiques business. Falco is rich and respectable. Flavia Albia has taken up his somewhat disreputable career. She has also taken over his old Fountain Court apartment and office. Can Flavia Albia live up to expectations? In this first book of the Flavia Albia Mystery series, Albia has acquired a nasty client, a contractor whose shoddy practices are responsible for the accidental death of a three-year-old child. Albia has no real desire to help her client wriggle out of paying compensation, but business is business. So except for her lost wages, she is not truly upset when her client up and dies unexpectedly of what seem to be natural causes. However, the contractor’s heir finds the circumstances suspicious and asks Albia to investigate. Although she can find nothing untoward about her client’s death, she does discover that there has been a recent rash of unexpected deaths, enough to rouse suspicion in high circles. Albia sets out to investigate, whether the higher-ups want her help or not. Naturally, this gets her into trouble. Dangerous trouble. I had a mixed reaction to Albia as an informer, some of which may be due to nostalgia for Falco. If you’re wondering–no, he makes no appearance in this novel. Albia has to sink or swim on her own, both as a legitimate investigator and as a legitimate protagonist in a novel, so she can’t rely on her much-loved, much-respected father for help. And yet, his echoes are there. Albia attempts to mimic his ironic/cynical way of thinking and his smarty-alecky backtalk. She uses sexual innuendo and slang along with the vigiles, the local enforcers of law and order, just as Falco used to do. But it didn’t quite click for me. Falco’s voice was always natural and amusing. Albia’s was forced. It always sounded just a little off. So I sound disappointed, and yet. . . by the end of the book, I was drawn in. Albia is surrounded by a wonderful supporting cast. The serial murders, based on a real historical event, was well-plotted and believable. And the male lead was a fascinating, complex character. In fact, he may be more of a draw for reading book two than Albia. If you’re a Lindsey Davis fan wondering whether to start this new series, go ahead and give it a shot. But if you’ve never read Lindsey Davis’s mysteries, I’d recommend starting with Silver Pigs. 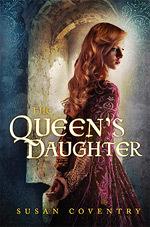 This is my 21st book of 25 read for the Historical Fiction Challenge hosted by Historical Tapestry. On another note– I’ve signed up with Bloglovin and am now using it to keep up with the blogs I follow regularly. If you use Bloglovin and want to follow Reading World, I’ve added the button to my sidebar to make it easier. <a href="http://www.bloglovin.com/blog/5221305/?claim=yrvf7aqn6vv">Follow my blog with Bloglovin</a> So, I've just signed up with Bloglovin, and now I'm "claiming" my blog. Let's see how this goes! Thanks to the women’s book group I’m in, I’ve read a few books that I wouldn’t have picked up on my own, mainly because they aren’t historical fiction. 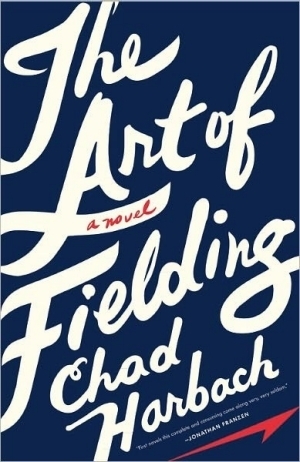 So I just finished The Art of Fielding by Chad Harbach. This is definitely a book club book. It’s a contemporary relationship book set in a small Midwestern liberal arts college that is ostensibly about baseball, but really isn’t. It’s more universally about youth and aging, goals and frustration, talent and the lack of it, hard work and luck, both good and bad. Using baseball as a metaphor for all this worked particularly well in this book because the author did such a good job playing on familiar baseball stories but giving them a twist. An omniscient narrator peers down on several characters, but particular attention is paid to Henry Skrimshander, a skinny teenager from a tiny town in South Dakota, who has memorized an infielders’ how-to book written by his hero, Aparicio Rodriguez, called "The Art of Fielding." Not only has Henry memorized the book, but he’s internalized the lessons. Henry is a shortstop for his high school team and he plays perfect defense, making it appear effortless. His skill is noticed by a college sophomore who is passing through Henry’s town for a tournament. Mike Schwartz, who plays football and baseball for Westish College, has become an unofficial recruiter for the college. He arranges for Henry to enroll at the school the following year and then becomes his mentor and personal trainer. On campus, Henry meets his roommate, Owen Dunne. Owen is something a shock to Henry because he is a black, gay, pot-smoking philosopher. Owen is also a baseball player, but a lackadaisical one. Owen sits on the bench reading. Additional important characters are the president of the college, Guert Affenlight, and his daughter (fleeing a bad marriage), Pella. To set the stage--Westish is used to having a losing ball team, until Henry arrives. Everyone can tell he is different. He has potential. When he is on the field, the team pulls together and plays real baseball. They begin to win. Henry chases his hero’s record for most consecutive games without an error. Scouts for the majors are beginning to call. It’s a classic sports triumph story. And then. . . Henry makes a whomping error. One error is nothing to worry about. But Henry does worry. His game falls apart. Not only does Henry unravel, but the lives of the people around him come into sharper focus also, and the reader sees just how messed up they are. The characters are so enmeshed in each others’ lives that the actions of one influence the others and there is a downward spiral for them all. It’s particularly heartbreaking because they are, for the most part, well-intentioned, caring people. Henry is rather self-centered, but he isn’t mean-spirited. And while the reader might like for some sort of storybook happy ending, there is something very real about these people that gives the sense that they may muddle through, but they will be coping with, not triumphing over, their difficulties. I was a bit hesitant approaching this book because of the hype around it and because the subject didn’t grab me, but I’m very pleased that my book club chose it and that I took the plunge and read it. We had a great discussion, with varying opinions on the characters and some of the plot elements. But everyone enjoyed the book and agreed that despite the length, it was a quick read. So, if you like literary books about baseball and college life, give it a try. And if you don’t think that’s quite your thing, you might still like it anyway. 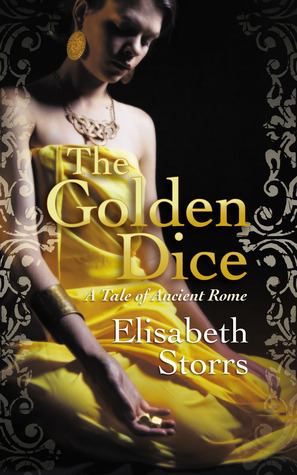 Over a year ago, I read Elisabeth Storrs’ first book in the Tales of Ancient Rome series: The Wedding Shroud, reviewed here. It’s a marvelous novel of a young Roman woman sent to Etruria as a bride to seal a truce. She didn’t want to leave Rome. She feared the man she was to marry and the strange customs of the Etruscans. Then, to her horror, she ended up being used as an excuse for war. I’ve been eagerly awaiting the continuation of the story and book two is now available on kindle: The Golden Dice. The Golden Dice can be read as a stand-alone novel, but to fully appreciate the richness of the backstory, I recommend reading The Wedding Shroud first. There is a bit of a spoiler here in continuing with Caecilia’s story, so beware of my summary if you’re intending to read the books in order. The Golden Dice begins seven years after The Wedding Shroud. Caecilia has returned with her Etruscan husband, General Vel Mastarna, to the city of Veii. Their marriage is a fruitful and happy one, but all is not well. War has erupted between Rome and Veii and both sides blame her. Throughout the spring and summer, Veii is besieged. Only the coming of winter provides a temporary reprieve, at least in the beginning, until the Romans under General Furius Camillus change their tactics to campaign year round. Many of the same tensions and hatreds simmer in this novel as in its prequel. Caecilia is mistrusted by the Veii and called a traitor by the citizens of Rome. Even her own family, those she once loved, have now sworn vengeance against her. Factions within Veii threaten her family’s safety and Vel Mastarna’s political influence at a time when Veii needs his strong guidance most of all. Two additional female characters are introduced to illustrate the Roman and Etruscan sides. Semni is a craftswoman, a potter, in Veii. A series of poor choices have left her cast off, alone with a baby, but with a friend in Caecilia’s household. Caecilia takes her in as a servant. On the Roman side there is Pinna, daughter of a farmer/soldier who lost everything serving Rome. Pinna became a prostitute at age eleven. Skilled at learning and manipulating men’s secrets, Pinna manages to gain a position as concubine to Caecilia’s cousin, Marcus, who is now serving under General Camillus. These two women provide insight into the sufferings of the "common" people, and by showing strong women from each side of the conflict, Storrs is able to ratchet up the tension and give a more balanced view of the characters. It’s hard to see Caecilia’s enemy as a monster when seen through Pinna’s admiring eyes. Etruria in 400 B.C. is a fascinating world and one that is under-explored in historical fiction. Elisabeth Storrs presents a complex, believable, intricately woven story of a woman trying to protect her loved ones from internal and external threats, while trapped in a city at war. This is my 20th book for the historical fiction challenge hosted by Historical Tapestry. When historical novel lovers get to talking about books and about Richard III, inevitably the novel The Daughter of Time by Josephine Tey will be mentioned. This classic, first published in 1951, is a detective story of sorts, but it’s difficult to pigeonhole it into the historical mystery genre. It’s almost more of a research paper disguised as a novel–but well-disguised. Tey is able to use the hunches or instinct of a detective as a cover for bias in a way that a historical researcher wouldn’t (or shouldn’t.) Presented as a detective digging through clues, the solving of a historical unknown is not only fun, but convincing. The protagonist is not contemporary to the crime; he is "present day" Inspector Alan Grant of Scotland Yard. Injured while chasing a criminal, he is stuck in a hospital recuperating and the boredom is driving him crazy. A friend who knows his skill at analyzing faces brings him a stack of portraits from historical figures whose careers were associated with unanswered questions so that he might delve into a mystery from the past. Skeptical at first, he nevertheless digs through the pile. He comes across an unnamed portrait and is struck by the sober honesty and suffering in the face. It puts him in mind of a judge. Grant is shocked to discover the portrait is that of Richard III–the evil monster who murdered his nephews, the princes in the tower. Grant is usually a much better judge of faces and he resolves to learn more about Richard III, to figure out how he could have been so wrong about the face. Although confined to a hospital bed, Inspector Grant has a fair amount of secondhand mobility. He is able to interview the nurses who care for him and a couple of visitors who come to see him, learning more about Richard and the history of the time, things he had been taught himself but had forgotten and things he had never been taught. It’s a wonderful device for instructing the reader but it can only go so far. The friend who brought him the portraits then sends him a young researcher who doggedly digs up more information, becoming as excited about the project as is Grant. The two are biased by their own hunches, but build a convincing case based on the material they present and on they arguments they pull together. Richard would not have killed his nephews. They find a more likely murderer. With the recent discovery of Richard III’s bones, the controversy has been awakened once again. Did he or didn’t he? What did happen to the princes? Just what kind of a king was Richard? He has his supporters and detractors, each with strong arguments. The Daughter of Time may be a novel, but it is so entertaining and Grant’s certainty is so convincing, you’ll likely find yourself on Richard’s side by the end of it, no matter if you tell yourself it’s fiction or not. I’ve had this book on my shelf for years, and finally read it for the 2013 TBR pile challenge hosted by Roof Beam Reader. 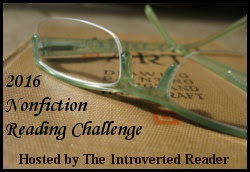 I’m counting it toward the historical fiction challenge hosted by Historical Tapestry as well. 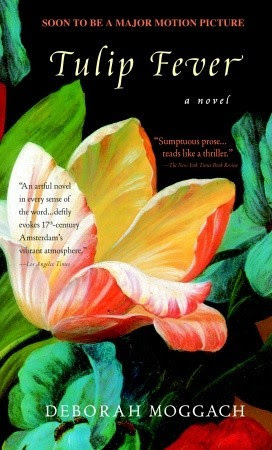 My book club chose Tulip Fever by Deborah Moggach for its last meeting, a historical novel set in 1630s Amsterdam, during the time of tulipomania–a bubble of speculation involving tulip bulbs. It falls into the category of novels about the-woman-behind-the-painting that are so popular. This time the artist is a young man named Jan van Loos. The woman is Sophia Sandvoort, the beautiful wife of the elderly and wealthy Dutch businessman Cornelis Sandvoort. Cornelis has already lost his first wife along with two sons to premature death. He married the much younger Sophia primarily because he wanted an heir, but her youth, beauty and sweetness have won him over completely. He loves her to distraction. Unfortunately, she has not gotten pregnant. Cornelis hits on another scheme for achieving immortality. He hires a portrait painter, Jan van Loos. Cornelis and Sophia sit for this artist, but before the first session is over, Jan and Sophia have fallen in love. Before too much longer, they are sneaking around, betraying Cornelis. Secondary characters include Sophia’s maid, a robust, passionate, country girl named Maria and a fish-seller, Willem, with whom she is in love. Their relationship is honest and uncomplicated, but they are poor. Adultery and treachery set the stage for disaster. Sophia and Jan need money to escape from Cornelis. Maria, pregnant and desperate, is entrapped in their schemes. The lovers catch the tulipomania that has snared so many others. Gambling on tulips brings on a feverish greed that nearly eclipses the excitement of their affair. The stakes multiply until they are playing for lives. I borrowed the book from the library a few weeks ago in preparation for book group. As it turned out, the book club met on the same day that I caught the plane for the Historical Novel Society Conference in Florida. I was going to miss our meeting. So do I still read the book? It is historical fiction and the jacket flap description interested me. So, yes. When I returned from HNS, I started Tulip Fever. But I almost didn’t finish it. Overall, my reaction to it is a bit mixed. It’s told from multiple viewpoints. Sophia is in first person and the other characters are in third person viewpoints. The chapters mostly bounce between characters but there are some omni chapters thrown in that are not really scenes but are descriptions of things or themes. The flow of the story does not really suffer from the constantly shifting POVs, but it’s difficult to care about the characters. Sophia, Jan, and Cornelis behave badly but with complete self-justification. Maria and Willem don’t behave badly so much as with a stereotypical country bumpkinism. Somewhere around page 100, I put the book down because it was too obvious where it was all going and I didn’t want to suffer along with these not very likeable people in a tragedy of their own making. However, after reading House of Earth, I went back to Tulip Fever and I’m glad I did. Even though much of it played out predictably, the introduction of the tulip speculation and Sophia’s ill-fated plans to escape from her passionless marriage made the second half of the novel more interesting. I haven’t read about the tulip bubble before and delving into that piece of the past made this a worthwhile read after all. This is my 18th novel for the Historical Fiction Challenge hosted by Historical Tapestry and my 14th book for the Library Reading Challenge hosted by Book Dragon’s Lair.